The areas of Brook Green, Fulham, Hammersmith and Ravenscourt Park compose the W6 post code. 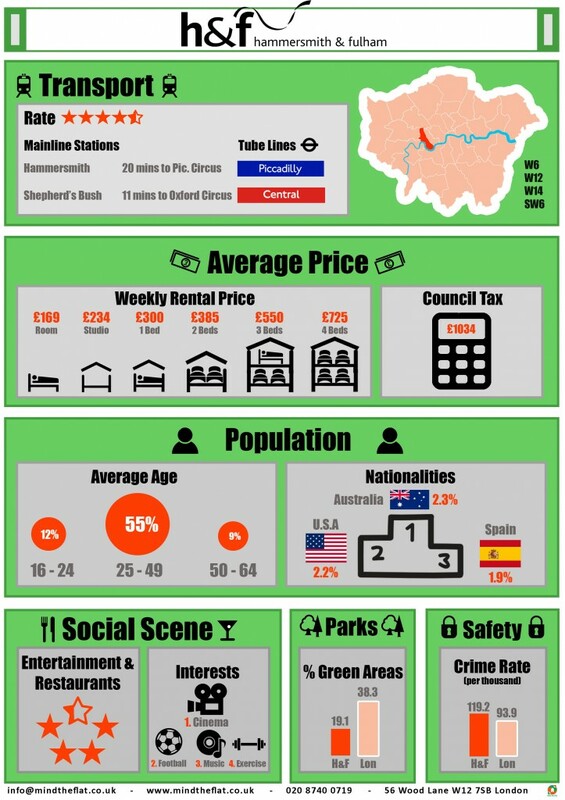 Hammersmith and Fulham could be defined as follows: buzzy, trendy, elegant architecture, nature and parks, riverside walks, active night life and great restaurants. Hammersmith Broadway is the center of all activity in the district, with shops, hotels and important concert halls. Ease of transport: truly well-connected area with four tube lines and a fleet of buses. Riverside: one of the main attractions of the area. Sailing is a common activity in the stretch of the river. It hosts the Oxford v Cambridge boat races. Shopping, Nightlife and Culture: Westfield Shopping Centre, great gastro pubs and bars, and important concert halls. Regarding transportation, the area is covered by three lines: District, Hammersmith & City and the Piccadilly line. Sign up with Mind the Flat and find like-minded flatmates willing to share a property in this active and trendy riverside area!